WB No. 243: MINI MOCHA is a high-performance sport boat meant to be accessible to all sailors—including those with severe physical impairments. The canting keel provides good stability in the vertical position, and exceptional stability when swung to windward. Mini Mocha’s hull form is based on high-performance ocean racers. Because of her wide beam at the transom, she is steered by twin rudders. The generous sail plan includes a 195-sq-ft asymmetrical spinnaker. The bowsprit swings aft when not in use. The canting keel mechanism relies on high-quality skateboard wheels that ride on semicircular bulkhead-mounted shelves. The keel is lifted by means of a small crane that socket into the deck. Canadian sailor Paul Tingley, a Paralympic gold- and bronze medal winner and an Open 2.4mR World Champion, was kind enough to be interviewed for our Sketchbook article featuring Mini Mocha. In that conversation, he presented the desirable features of racing boats intended for people with physical disabilities. “The first thing people learn when they’re in the hospital with a spinal cord injury is that every one is different: Everyone’s range of motion and physical requirements are different. Some sailors are born with disabilities. 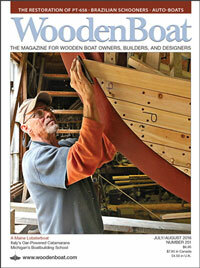 Having a boat that removes a lot of the physicality required to sail is huge. The canting keel taking the place of having to shift your body on each tack would open up the boat to a lot of people. And having a fixed crew weight really levels the playing field: You’d get to concentrate on setting your sail shape, then playing the chess game that we call sailboat racing. Evening out the boats is very important, as the race then becomes more of the mind than the body. “How well the seat can be adjusted is really important, as some people can’t use their legs to brace for pulling on lines. In my case, I have to rock the seat aft so the back is angled and the lower part is angled-up at the front. In the recent 2.4mR Open World Championships, held in Toronto and open to able-bodied and handicapped racers alike, Norwegian Bjørnar Erikstad came in second overall, and he doesn’t have any arms—his hands are at his shoulders. He’s an amazing athlete. He has to have his body at the front of the cockpit because he has to use his mouth to pull and hold onto lines. Another Paralympian, Helena Lucas of the UK, came in third overall. “Foot-pedal steering would be a good option for many, even for able-bodied people. You get used to them pretty quickly. Having a spinnaker is a big appeal, as sailing downwind in light winds without one can be pretty slow and pretty boring for spectators. It’s important today that races be exciting for more than just the racers. 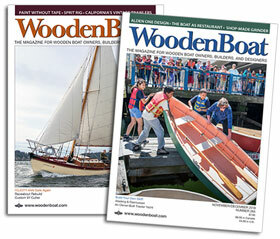 See more in Designs: Sketchbook, WoodenBoat issue 243.